We’re delighted to introduce the newest member of the Fizz Festivals team – David Lane, Musical Supervisor. David was part of our first Proms & Prosecco in the Park event, accompanying a number of our performers on piano and has a vast range of musical experience. David was classically trained on piano and pipe organ from the age of 7 and has been a professional musician for over 45 years, working in all kinds of music, from classical to rock, pop and jazz. Since joining Bill Kenwright’s tour of Joseph as keyboard player in 1984, David has been involved in theatre work as Musical Director or keyboard player for numerous shows, on national tour and in London’s West End, including, Joseph and his Amazing Technicolor Dreamcoat, Oliver, Kiss Me Kate, Fame, The Goodbye Girl, 42nd Street, Pirates of Penzance, Carousel, Seven Brides for Seven Brothers and Fiddler on the Roof and also, in 2009 he was Musical Director of Singing in the Rain for UK Productions, which toured internationally, finishing in Istanbul. He certainly knows musicals! He was Musical Director for his first pantomime in 1989 (oh yes he was!) and since 2000, has worked for QDOS, the world’s biggest pantomime producer, on some of the UK’s most spectacular pantomimes. Christmas 2018/19 saw him at Bristol Hippodrome, working with Brian Conley and Gok Wan and playing to over 80,000 people in 4 weeks! David is also a keyboard player with the popular sell-out concert tour, Beyond the Barricade, which has been touring, nationally and internationally, for 20 years. During his varied musical career he has also been Musical Director of Malvern Theatres Young Company and has worked as Musical Director/Vocal Coach for the cruise division of QDOS, rehearsing the singers for the production shows on the Cunard Ships, Queen Elizabeth 2, Queen Victoria, Queen Mary 2 and P&O’s Britannia. As well as working with Fizz Festivals, David runs his own successful music company Wedding Piano Music, providing a bespoke music service for weddings, civil partnerships and events of any kind. He lives in Hollywood, South Birmingham, with his wife, Susan. 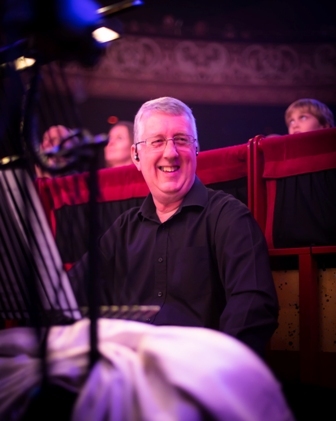 David will be putting together the musical line up for each of our events, using his vast network of musical contacts and coordinating our fabulous “Last Night of the Proms” style finales. You may even spot him on stage, behind the piano, accompanying our soloists and finales! We’re thrilled that someone of David’s experience has joined Fizz Festivals and if you spot him at any of our events, do say hello – he’s a very friendly chap!